Four day weekend? Yes please! I made the most of it, too. Thursday, after all the usual Thanksgiving activities were done and I was back home, I decided I was sick of the same 3 instances over and over, so at level 71, Kalethos headed out to Dragonblight to lay some smackdown on some quest mobs. That … turned into 3 and a half levels of re-living the storyline, culminating in the achievement Might of Dragonblight after 130 quests … and he didn’t do the ones that lead up to Really Big Worm, either. (And yes, I still cry when I watch the Wrathgate cinematic.) It was also a reminder of one thing that Wrath did very well … and Cata failed at, at least in the 80-85 zones – separate storylines for both factions. If you have never played through Dragonblight on each side, you’re missing out. There is so much lore in the questlines there. If you do any of the high level Cata zones other than Twilight Highlands … you see it all the first time, regardless of your faction. Now, this is not true in the revamped 1-60 zones, so I can cut them some slack given the massive undertaking that redoing the original continents represented. But I hope that they will find some way to make the factional quests more divergent in MoP. As for the actual Pilgrim’s Bounty … the only part that proved troublesome was finding rogues, particularly of the opposite faction. Used to be everyone hung out in Dalaran and would make rogues and stick them on the bank steps. Failing that, you could always get a friend to create one for you. Well, *I* still hang out in Dalaran, but most of the population doesn’t (part of the reason I love it there even more than before). And a good portion of my friends were ‘out of town’ over the weekend … where out of town mostly means playing SW:TOR. Fortunately, Blizz has provided an elegant solution, whether intended or not. Because now, you can just create your own! (Super thanks to one of my fellow Night Stalkers for the suggestion.) You know those ‘free to level 20’ trial accounts? Yeah. Just attach one to your account, and make what you need. I was hesitant because I knew my computer would balk at running two instances of WoW at the same time. But as long as I only logged into them both for as long as it took to use one turkey shooter (i.e. no running around and trying to do things) it was fine. So I made a nelf, a gnome, and a dwarf for Vanicus. And I made an orc, a nelf, and a dwarf for Kalethos. It is VERY strange to be on another toon, and be looking at .. .well, your own toon. Like being outside your body. So weird to be standing there looking at Kale. So … after the 130 quests in Dragonblight, I was understandably sick of questing again. lol. So I hit dungeons until I got to 76 and could start the Oracles questline. Well, ok, almost 76. I was at 96% and figured I’d just head over to Sholazar and either ding on exploration or find something to kill. So I flew over to where Pitch is, since killing him starts off the whole thing. I overshot the location though, and what did I see near the pillar? Just seeing him in the wild gives me goosebumps. All those months I spent camping his spawn points in early Wrath on my then-main hunter, and then on his first visit to the Basin my third paladin just stumbles right on him. Between that questline and a lot more dungeons, he hit 78 last night. His JC, enchanting, and cooking are all at 425 and ready for Cata content. 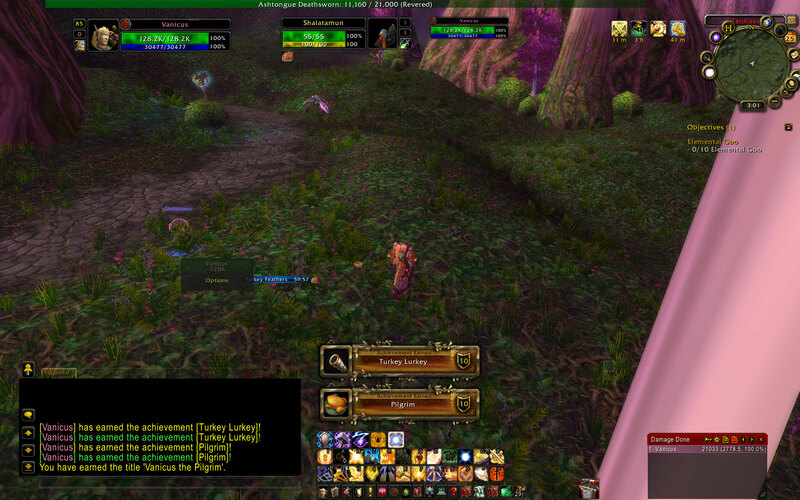 Just gotta get those last two levels of xp …and yes, I know Northrend xp is getting nerfed. Is it tomorrow? I didn’t want to wait. What else was I gonna do with a 4 day weekend? I … am not a big fan of Pilgrim’s Bounty. Ok, I love the ability to level cooking quickly and easily. All of the toons on Winterhoof, including the shiny new level 15 dwarf shaman, now have cooking above 300. But with the patch and all, and with it not counting for the meta, I had little motivation to go out and sit at enemy city tables and go around turning rogues into turkeys. However, since I had three toons, well four really, sitting at just needing to finish three or four of the achievements for it …. I wimped out and only did them all on Kerick, since he’s already been designated one of my co-mains for the launch of Cata. 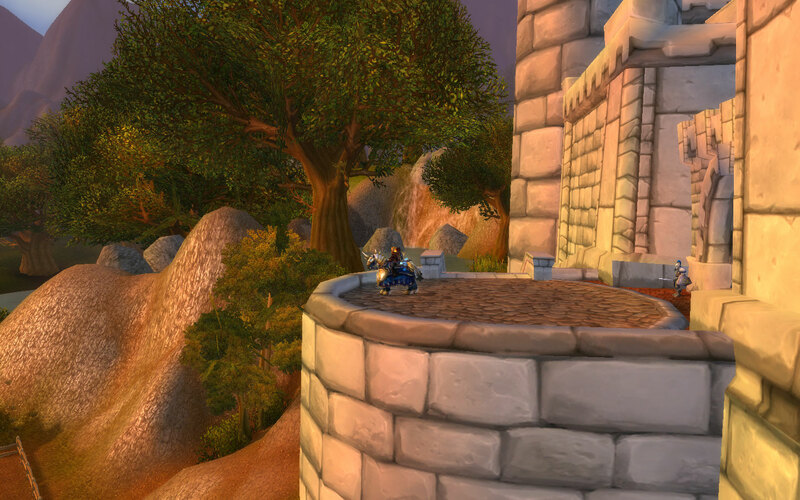 He ran into a beautiful sight while passing through Mulgore on the way to the Thunder Bluff tables. Yes, Mazzranache has chicks! And no, he did not kill her. She aggroed on him as any good mother would, but he rode on. Come on, what kind of a guy do you think Kerick is, anyway? There is a reason he wears the title Kerick the Noble … call it cliche if you will but he is a Paladin of the Light, my True Knight, my White Knight, my Knight in Shining Armor, … and to top it all off, he’s Holy, Healing the Wounds of the Righteous. Big super awesome huge Thanks to Lyssi for making a troll rogue so I could finish it all off. Hopefully she got a better screenshot. If not … well, this is what you get! So there.